When Walnut Hill Medical Center opened its doors in April of 2014, Forbes magazine called it “The hospital Steve Jobs would have built” — not because it was built from the ground-up to support cutting-edge technology, but because Walnut Hill is “founded on the premise that the patient is first,” a mantra that is evident in everything from the “15-5” rule to the design of the rooms. For Aaron Miri, the opportunity to serve as an enabler in improving patient care was too good to pass up. In this interview, he talks about what he’s learned from his mentors, his strategy to incorporate wearable technologies into everyday practice, and the challenge Walnut Hill faces of how to grow meaningfully without losing its core values. That’s one important dimension that I can’t stress enough to people that eventually do want to land in a CIO spot and a C-suite, which is to seek out good mentors. Everything you’re doing, whether it’s integration, whether it’s innovation, whether it’s a tech, whether it’s process improvement — it’s about the patient. And I think that the return on value equation is going to become more important than the return on investment equation in the future. I think if you are in a very traditional environment where maybe it’s still about the dollars and cents, you start to lose focus on what the patient element is. Don’t sit in your office all day with the door shut. Don’t sit there and live in a tech world. We have to be part of the solution. We have to drive this thing forward. Gamble: It’s pretty obvious with the appeal that you saw in coming to Walnut Hill. You said it’s a bit about six months? Gamble: So before this, you were Chief Technology Officer at Children’s Medical Center. That’s an interesting transition to me. Can you just talk a little bit about what that was like and maybe what feelings you had going into that? Miri: Absolutely. It was an absolute honor to be the Chief Technology Officer for Children’s Medical Center of Dallas, led by a phenomenal CIO with Pamela Aurora. I had a team of 150+ individuals, a budget in the tens of millions of dollars, numerous buildings, numerous institutions, so many different service lines, and very complexed organizational partnerships with the other affiliated organizations, and it was an absolute blast. I cannot thank Children’s enough for the experiences and the mentorship and the guidance and some of the wonderful things we’re doing from a pediatric sense. For me, with the transition though from CTO to CIO, what I didn’t realize was how much more there is at the CIO level in terms of an organizational perspective. As a CTO, my primary function was to make sure that the technology worked, that it was integrated, that it played well with what the clinicians needed to take care of those sick kids and so on. As a CIO, it’s the organizational imperative to making sure that information is leveraged strategically to help the patient, to drive things forward and drive the business forward. It’s the other half of the equation and so if you look at a yin and a yang when you have the CTO and CIO, they compliment each other. In my personal mentorship, guidance, education, and learning, I always knew I wanted to be CIO. What’s interesting though is how much more there was at a CIO level that I simply didn’t have exposure to until I’m in the role now. I find it a blast. I can imagine that for some people though that might be a lot more than they’re willing to bite off, and they want to go back towards just being in the technology versus worrying about all the other dimensions of the business. So for me, it was a very natural and very fun progression. And I think all the things that I was exposed to at Children’s — the wonderful leadership, the great clinicians, the things that were happening there — all played a tremendous part into growing me into who I am today to take this role on and not be scared off when someone told me, oh by the way, this is the hospital that Steve Jobs would have built. I had to ask, ‘What? What do you mean by that?’ And now I know, and it’s a wonderful thing. Gamble: Coming into that role, when did you find that it’s really more of an organizational focus, was that something were you reached out to people? How did you get more accustomed to that role and find your style as CIO? Miri: It goes back to the very central principle of mentorship. Over the years, I’ve been very blessed to work alongside some of the most noteworthy CIOs in the industry — 30-year tenure CIOs, CIOs that were once nurses, CIOs that came from different parts of the country that know manufacturing and other industries, and none of them were ever reluctant or hesitant to teach me something or show me how or why or whatnot. So that’s one important dimension that I can’t stress enough to people that eventually do want to land in a CIO spot and a C-suite, which is to seek out good mentors. I’ve also had hospital presidents and others mentor me indirectly and that was invaluable. Number 2 is formal education. I went through the CHIME CIO boot camp a number of years ago, which I cannot speak more highly of. I think that gives you such a great sense of, ‘Here’s what’s going on as a CIO — are you sure you’re crazy enough to want to do this job?’ It’s a very good, very real perspective of what’s being and what’s happening being taught by CIOs. I went through the CHCIO certification through CHIME, which is an excellent test. At HIMSS, I’m the chair of the public policy committee and so I serve alongside some wonderful leaders across the whole healthcare spectrum. I’ve been lucky enough to have mentorship, both formally and indirectly. I have access to people and resources to reach out to and say, ‘hey, am I crazy? This is what I’m seeing,’ and the network of people to navigate hurdles like Meaningful Use for a brand new hospital, that all gave me the tools to be successful and really hit the ground running and catapult me forward and the organization forward. It takes all of those dimensions working together to really make for somebody to be successful as a CIO, a good CIO. And so I encourage folks to always participate, always ask questions, be nice to everybody, and never be afraid to ask for help, because the first thing I did when I officially landed this role was reach out to all of my mentors formally and say, ‘I just want to let you know I decided to take the leap. By the way, can I take you to lunch sometime and pick your brain?’ And they were all like, ‘Absolutely, Aaron.’ Your network is very important. Gamble: Was there anything from those meetings and conversations that really particularly sticks out or was it just like grabbing a whole bunch of nuggets of information? Miri: A little bit of both. I think the common themes were making sure that you understand what the value is to the business — not necessarily what the value is to technology or to the IT team — and making sure that you ask a lot of questions and you understand truly how to innovate for the organization. All those common themes really stood out to me. And those were things where inherently I had figured, ‘okay, I’m going to go about this route. This is how I’m going to help drive this thing forward.’ But it was reassuring to me to hear from such veterans in the community that this is the right way. This is how you handle it. This is how you deal with things, and you can always lean on other folks or ask questions. That’s important. 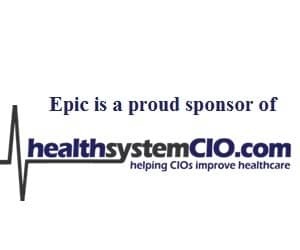 The CIOs, and particularly the healthcare CIOs across the country, seem to always have each other’s back. And so it doesn’t matter who I reach out to, if I ever met them formally or I don’t even know them; maybe they’re part of CHIME and they’re going to the same thing I might be going through. They always want to help each other. So for me, it’s good to know that you’re not alone in the universe. I think it’s really been a little bit of everything, pushing it forward and making sure we don’t lose sight of our mission, which is to put the patient first. Gamble: There’s so much interesting stuff there and I guess the best way I think to close this out is to get your thoughts about where the role of CIO is going to continue to go. We talked before about how what is now the CTO role maybe is more similar to what the CIO role used to be. So maybe just your thoughts about where you think things are going to continue to go as far as the evolution of this role. Miri: Absolutely, and I appreciate that question. For me, I go back to tech as enabler. Good tech can be a good enabler, but technology can never be the enabler. It has to be part of the collective of people and processes driven for the same reason. And so for me the CIO role of the future is almost a culmination of a Chief Experience Officer plus a Chief Information Officer to where you become almost a Chief Patient Officer. And everything you’re doing, whether it’s integration, whether it’s innovation, whether it’s a tech, whether it’s process improvement — it’s about the patient. And I think that the return on value equation is going to become more important than the return on investment equation in the future. And so some of the things that I’ve been blessed enough to become a part of here at Walnut Hill in being focused on the patient are glimpses, at least what I see, of where the CIO is going to be in the future. And I think as more and more CIOs across the country become more engrained with what’s driving forward business and what’s driving forward healthcare, they’re going to become more of that chief patient advocate, that chief patient officer, and really leverage the information from the various systems, whether it’s population health, whether it’s internal, whether it’s through your HIE, driving forward the meaningful quality experience for the patient. Gamble: It’s interesting in speaking to CIOs how we are starting to see this change, and it’s the direction where you want things to go, but especially from your shoes, it must be pretty fascinating to watch this all unfold. Miri: It is. I report to the CEO here at the organization and we have such a phenomenal patient-centric CEO and so it starts with executive leadership. Again, we have physician partners that are still in the board and the physicians are just as patient-centric, so when you have board, CEO, senior leadership all focused and rallied around the same thing, the CIO role then can morph and become that. I think if you are in a very traditional environment where maybe it’s still about the dollars and cents — which I’m not saying is not important, but that becomes the overriding principle — you start to lose focus on what the patient element is, because you’re really more worried about, ‘okay, I need to make sure that my head count is X dollars or my infrastructure isn’t too far aged.’ When you start worrying about more of the tech stuff than the patient, to me, that’s the CIO of the past. I think the CIOs now and heading into the future really are changing the industry on its head, which it’s needed too, and really growing healthcare as it is. From Walnut Hill’s perspective, what was so attractive to me to come here was to work alongside leaders in the industry that are all about the patient; to work alongside clinicians and physicians that are all about the patient. Again, it makes it fun. Gamble: And just out of curiosity, having that whole comparison to or being called ‘the hospital Steve Jobs would have built,’ which I think a lot of people have heard, is that a little intimidating? Miri: I think it was more curiosity. I made me raise an eyebrow. It wasn’t intimidating as much as it was exciting and then it was kind of like the gauntlet’s been thrown; you can’t exactly get any less than that, so how do you get better than that? Let’s get better than that. If anything, it set a very high bar that the team must strive toward, but we’re never going to meet it. We’re always going to exceed. So now we’ve got to exceed that, but that’s such a compliment to this organization that I often wonder, well what is better than that? We’re definitely getting there. Gamble: It sounds like Walnut is doing some really interesting, groundbreaking work, and I really appreciated hearing about everything you guys are doing. Miri: And I appreciate the opportunity. What I would definitely comment on is that this time period right now in healthcare, these are some of the most important days. The technology decisions, the legislative decisions, what’s going on right now with society and the needs with healthcare particularly, we have to get this right. And so I often say this, and it’s very important to me and it’s very much a passion for me, is that CIOs must get engaged. They must participate. They must be part of the business decisions, the strategic decisions, and the legislative decisions, whether it’s advocating on the hill in DC, whether it’s being part of an organization like HIMSS or like CHIME, or whether it’s simply being participatory and partnering with your fellow C-suite. Don’t sit in your office all day with the door shut. Don’t sit there and live in a tech world. We have to be part of the solution. We have to drive this thing forward. I’m blessed to be part of an organization that encourages that and for the other CIOs out there that are looking to figure out how they’re going to make a difference, participate. Engage. Move the ball forward. Gamble: That’s really great stuff. Great advice and insights. I really believe our readers are going to appreciate it. Thank you so much for your time. Miri: Thank you very much. We appreciate the opportunity, and I’d love to do a follow up at some point to continue to talk about what other things we’ve done to change the game in the whole area here. Gamble: Yeah. I’ll definitely like to follow up with you. Gamble: Alright. Thanks so much and I’ll speak to you soon. Miri: Have a great one. Take care.